Where are Outlook Spam Folder and Outlook Spam Settings? Spam folder is a folder for storing spam messages filtered out by FREE anti-spam plugin Spam Reader. Default location is "Spam" subfolder of "Inbox". To specify another location click the "Browse" button. In the displayed "Select Folder" window you can either select one of the existing folders or create a new one. 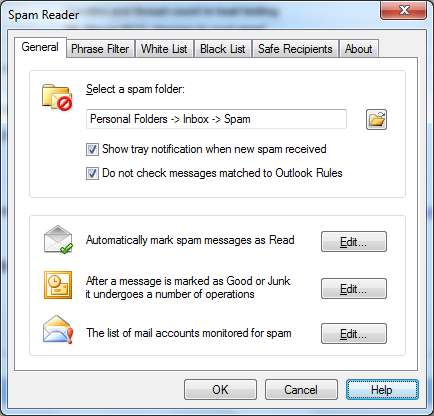 Spam Reader's interface includes Options dialog built into standard Microsoft Outlook interface. You can change the outlook spam settings for increasing spam filtering performance. On General tab of Spam Reader options window, you can view and change some primary Spam Reader settings. 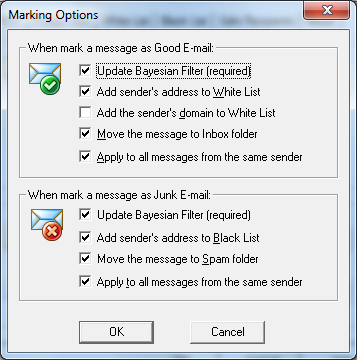 You can also set the interaction with Outlook Rules and change Marking Options. Show tray notification when new spam received. If you want to know about new incoming spam the program can display tray notification window when you receive a new spam message. Mark "Show tray notification when new spam received" checkbox and in the future you will see this tray window at the right bottom corner of the desktop every time when you receive new spam messages. Change Marking Options. When you mark messages using "Good E-mail" or "Junk E-mail" buttons Spam Reader performs a number of operations with them. If you want to edit the list of the operations, click "Edit" button. In the displayed window you can add/remove the operations by marking the corresponding checkboxes.